The BNP Paribas Open is held annually in March in Indian Wells, California. It’s known for being the best-attended tennis tournament outside the four Grand Slam tournaments and has the second-largest permanent tennis stadium in the world behind only Arthur Ashe Stadium in New York. This has led to the event being named the unoffical 5th Grand Slam event­—to go along with the Australian Open, French Open, Wimbledon, and the U.S. Open. This year’s tournament will run from March 4-17 and will feature some of the best players in the world attempting to defend last year’s titles. World number one Naomi Osaka will try to defend her women’s singles title, while Juan Martin del Potro will attempt to do the same in the men’s draw. Last year, American doubles team John Isner and Jack Sock took home the men’s doubles title defeating fellow countrymen Bob and Mike Bryan in the championship. It was the first time two American men won the doubles title since the Bryan brothers win back-to-back championships in 2013 and 2014. Doubles tennis is unique because you have a teammate on your same side of the court that you must communicate with at lightning fast speeds. The court of play is extended to the doubles sidelines, making the doubles alley in play for more court space. One player often plays at or near the net, while the other will play back towards the baseline. Players use different strategies when playing doubles versus singles. See if you can spot some of the differences while watching the event. 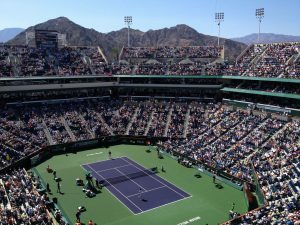 The BNP Paribas Open will be televised on the Tennis Channel and ESPN this year. Matches will also be streamed online.